Trips to Macedonia, Belarus, Kazakhstan and Albania are all possible destinations for Cork City and Shamrock Rovers. 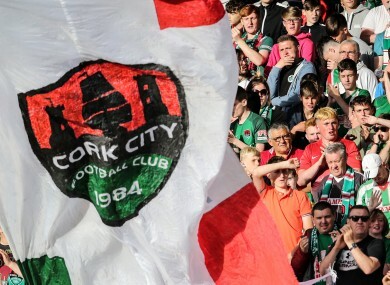 Cork City supporters in the Joe Delaney stand during last night's clash with AEK Larnaca at Turner's Cross. CORK CITY AND Shamrock Rovers may be in difficult positions after last night’s Europa League action, but both sides now know what lies ahead should they turn their respective ties around in the second leg. If they ultimately overcome AEK Larnaca — the Cypriot side who beat the Leesiders 1-0 in last night’s first leg at Turner’s Cross — the League of Ireland leaders will face the winner of Macedonia’s Rabotnicki v Belarus’ Dinamo Minsk in the Third Qualifying Round of the Europa League. Meanwhile, should Shamrock Rovers recover from a 3-2 deficit against Czech outfit Mlada Boleslav, they will face either FC Kairat Almaty (Kazakhstan) or KF Skenderbeu (Albania) for a place in the play-offs. The first legs involving FC Kairat Almaty-KF Skenderbeu and Rabotnicki-Dinamo Minsk both ended 1-1, so it remains difficult to predict the likely opponents should the Irish teams progress. Email “Irish sides discover potential Europa League third-round opponents”. Feedback on “Irish sides discover potential Europa League third-round opponents”.